Jordan's overall playoff record is obviously sparkling, but it wasn't always that way. In the early stages of his career, he simply could not handle the Bad Boy Pistons and their "Jordan Rules," falling to them three years in a row. 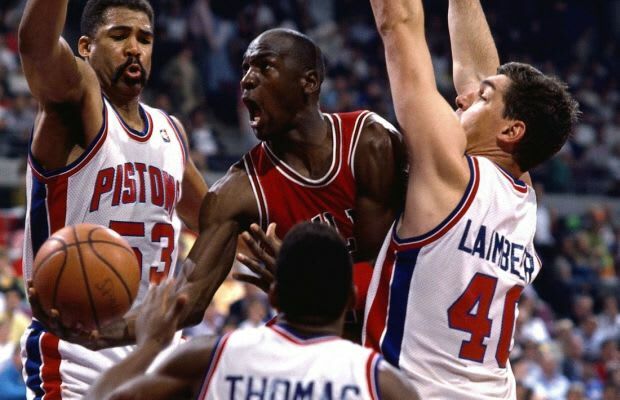 Detroit would absolutely brutalize MJ off the ball, and when he did get the rock they would almost always send swarming double teams to force him to give it up. While it didn't always limit Jordan's scoring, the difficulty he had in getting those points and his relative lack of a supporting cast made it extremely difficult for the Bulls to get by their rivals, which they finally did on their fourth try in 1991.